Just listed in Davie: This is a single family home with an attached in-law apartment, 2-car garage and secluded pool. Off Griffin Road on a dead-end cul-de-sac this home sits on 4/10ths of an acre, backing up to an unoccupied Palm-Tree Nursery. The home features three bedrooms and two baths, PLUS a convertible 1-bedroom in-law apartment with another bath, separate kitchen, separate entrance and French Doors overlooking the pool. If you are coming from the west, follow Griffin Road to SW 72nd Avenue and turn right. If coming from the east, you’ll have to make a U-Turn at SW 73rd – BE CAREFUL! Turn right on SW 72nd Street and follow it all the way to the end. 4785 SW 72nd Avenue is the last house on the right. Would you like to arrange a tour? Contact Robert by text or call to (954) 446-9001 or using the form below. Check out this amazing location for a wonderful townhome in Scarborough! Walking distance to the best schools in the district. 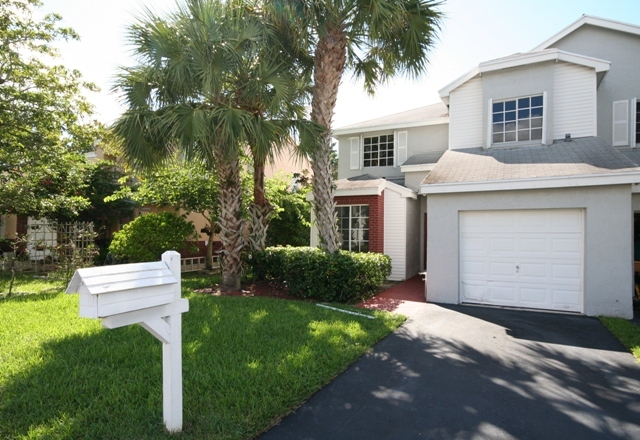 Convenient to I-95, Turnpike, I-75 plus so many shops & attractions. Four bedrooms with Master Suite on ground floor featuring walk-in closet, shower & double bowl vanity. View overlooks tranquil late with enormous yard. Three beds upstairs with hall bath. Beds all carpeted, nice ceramic tile in living & dining. 1-car garage is attached with room for another car in your private driveway. Guest parking available only steps from your front door. Freshly cleaned & painted. If you would like additional information about this rental townhome, or you would like to schedule a viewing, please contact Robert at (954) 446-9001 or message me through the form below.